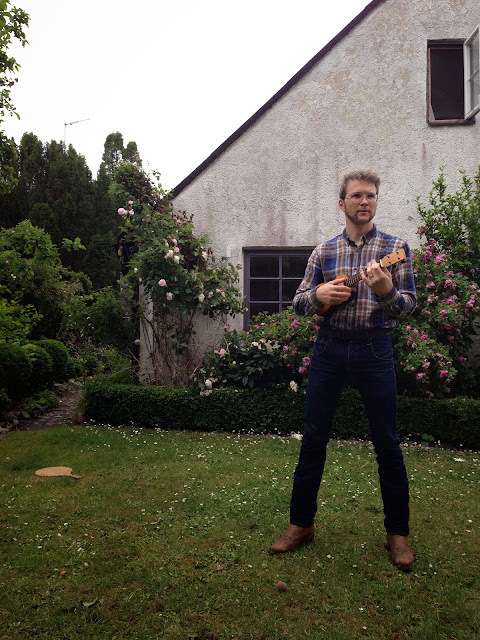 I rushed things a bit at the end so I could bring my new uke with me to Skåne, the southern part of Sweden. So the pics are from my friend's garden (a garden of unexpected treasures, as you shall see at the end). The bridge is small and the slot for the saddle is angled. I might change the saddle later, the height at the A-string needs a little finetuning. 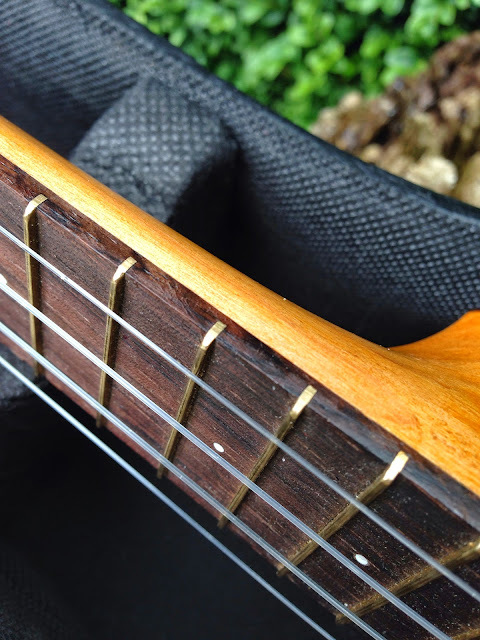 And the bar frets, I tried to show the profile but the rounded off ends make it a bit hard to see. Me rocking out in D minor (the saddest of all keys, makes people cry instantly). But what of the treasure of which I spoke? Well this old garden has really really large lilacs and among them I saw a stump. So I asked my friend and sure enough, the wood was still around. 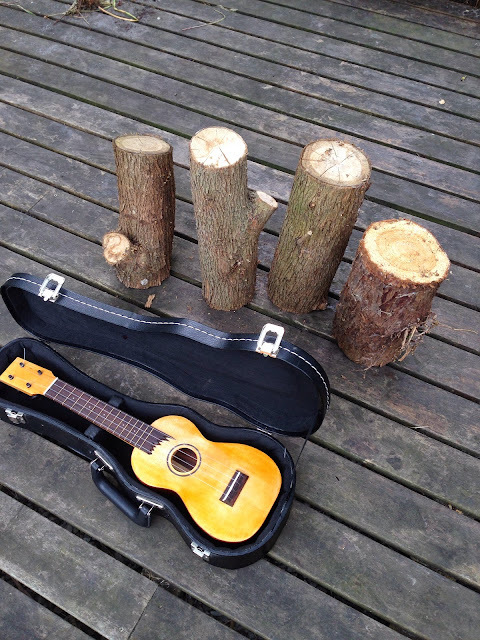 So look here, three fretboard material stumps and a fourth stump of a mystery conifer that had fallen over. Don't know if it's good for anything but I'll bring it home and cleave it. 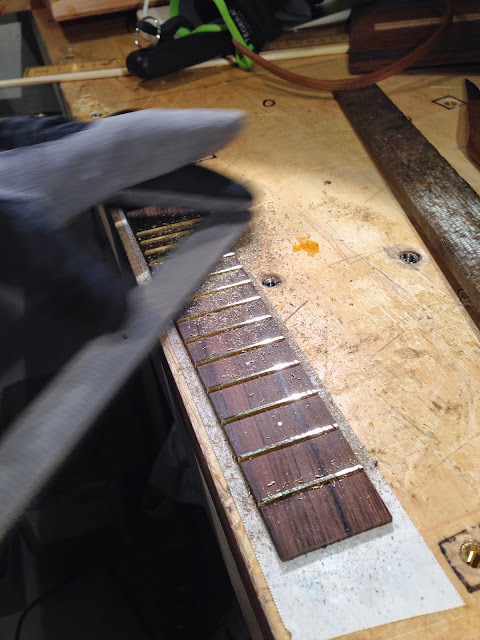 That saucy rosewood spruce combo will get bar frets. I have them on my first soprano and I think they work fine and look cool. 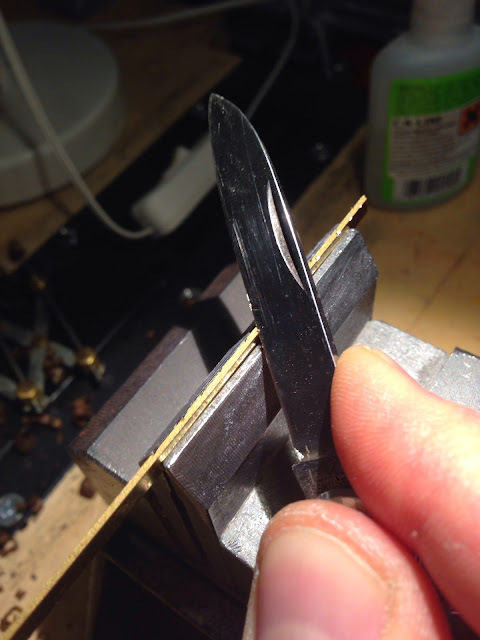 I have two different profiles from the hobby shop, 1x3 and 1x4 mm. This fretboard is thick enough for the 4 mm, the slots are 2 mm deep and I need a bit to work with to get the crown profile right. 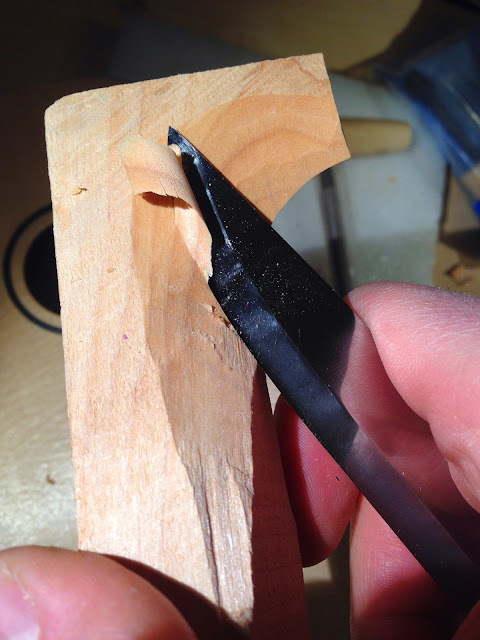 First I mess up the bottom edge a bit with a crap knife. Then I put a small amount of ca glue in the slot, just a bit of insurance. Since they'll recieve some heavy filing I can use a steel hammer to drive them down. 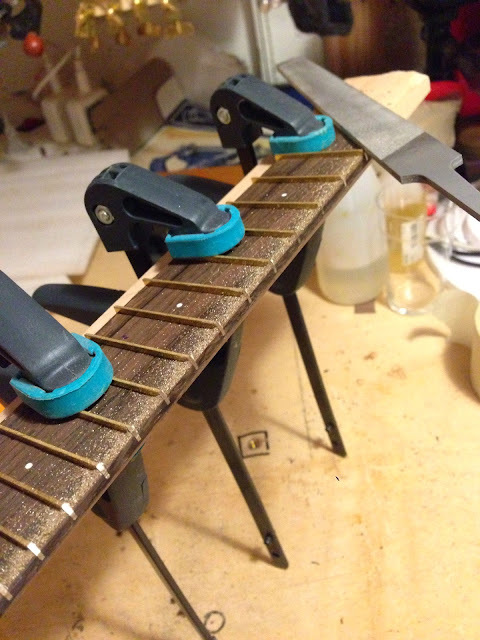 Then I file the edges so they're flush with the fretboard edge. 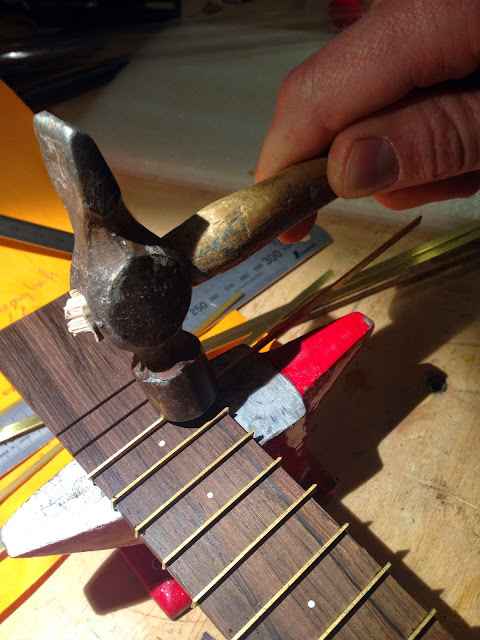 I also check the fretboard so it's the right width at the nut and 13th (my necks join the body at the 13th fret). 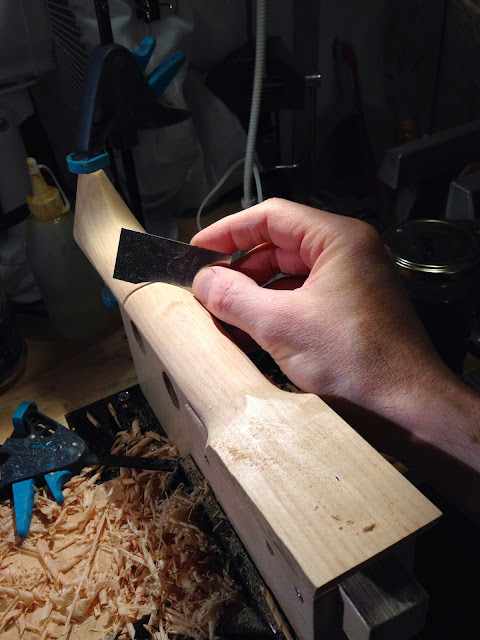 The board is clamped to a piece of maple, filing a bowed board will give you a convex edge. Then I take down the height. All frets were level but too high so I went at it for a while. 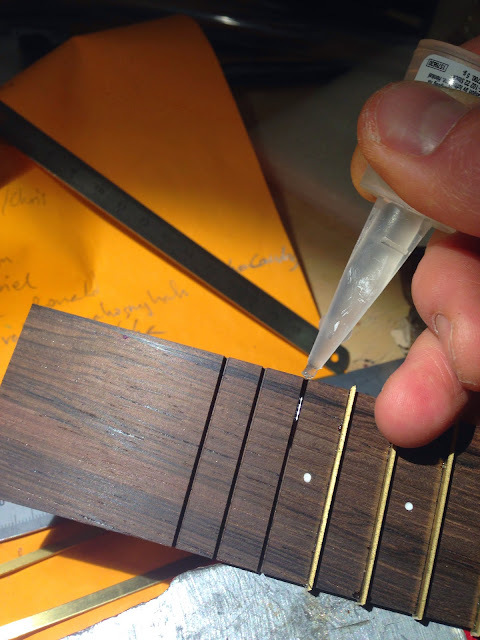 After this pic I measured the frets to just over 1 mm, so I rounded them with a small fret file. No pics from crowning I'm afraid, and now it's all glued to the neck. Oh heck, I didn't take a pic of the back braces either. Or of the back as it went on. 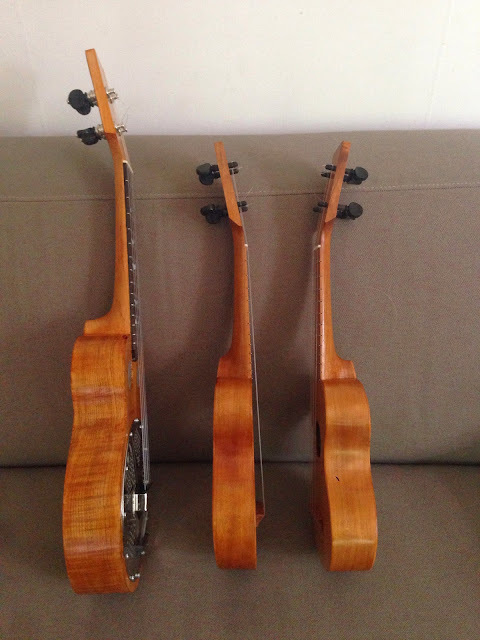 Yesterday I strung up three new ukes, a reso of ash and alder and the two zero sanding piccolos. You can see videos of them here. Well. You all expect an update on that poor tenor guitar right? I swear, I was going to. But then I got an email about what woods I had in, and I rummaged a bit and stumbled upon some rosewood back and sides that I bought a long time ago. So when the family was out I rolled out the drum sander and brought them to thickness along with a fretboard blank. 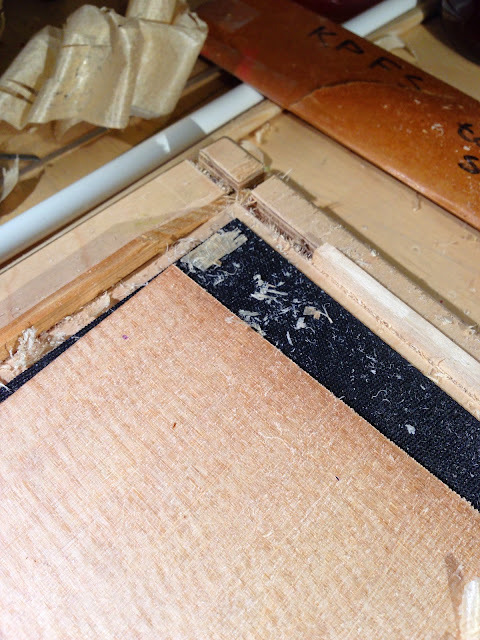 Disaster struck during the last pass - one of the sides got jammed under a guide piece on the sander and ground to a halt under the drum. I quickly turned the crank to raise the drum but excited as I was I turned in the wrong direction. The drum lowered into the wood, leaving a slanted groove across the wood. I sat there looking at it, cursing. 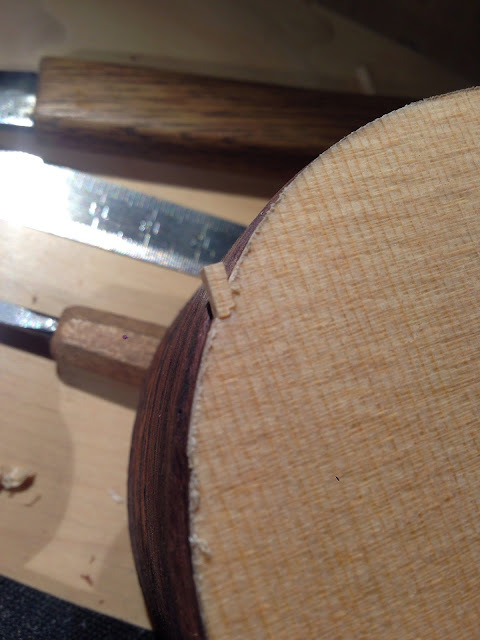 The piece was around 1.7 mm but at the groove there remained 1.1. 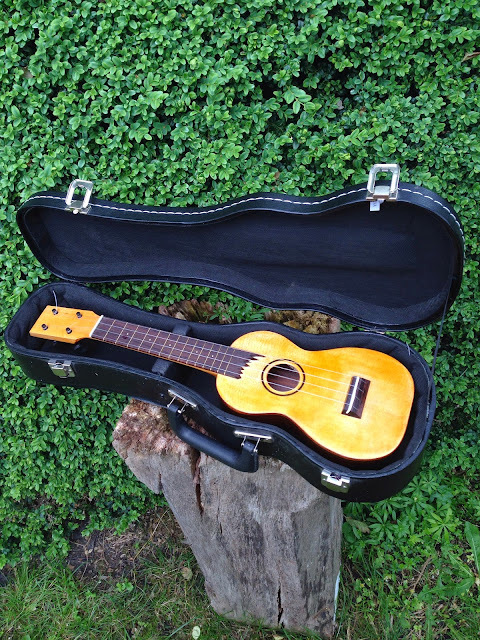 Next time I looked at it, a couple of days later, I realized that chickening out is not the ukulele way, so I went ahead and bent it. Lots of heat, the right amount of water and no stopping for pictures. 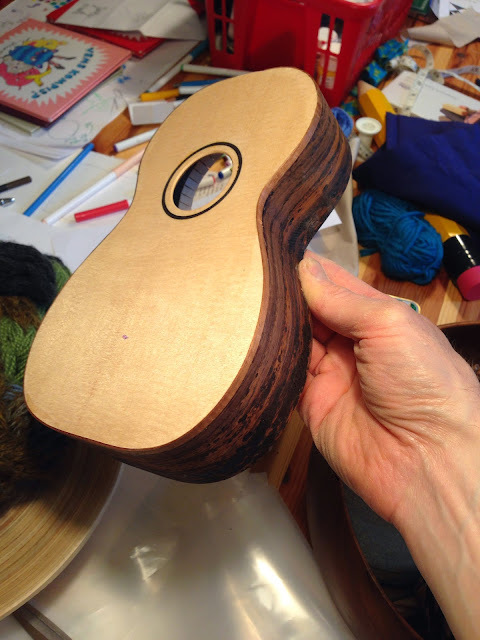 I positioned the groove at the lower bout, thinking it would stand a better chance in the bigger radius, but thought about the upper bout with an option to fake a cutaway if it broke. Luckily the groove wasn't at right angles and it went well! 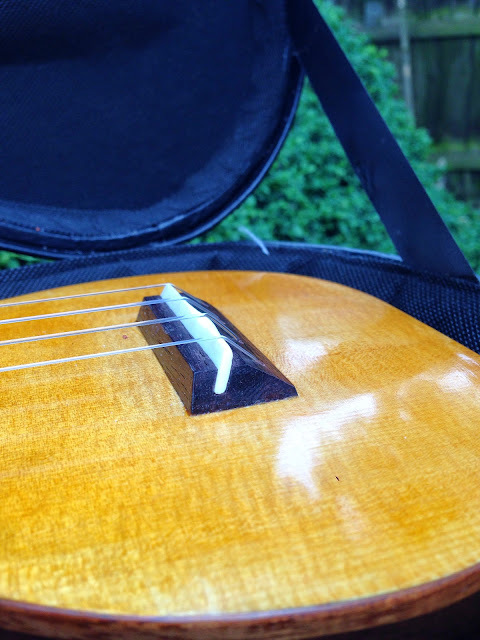 I quickly bent the other side and started on a spruce top. 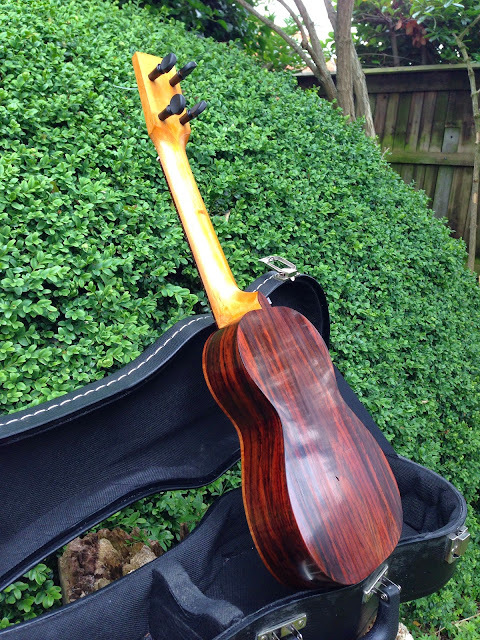 Rosewood and spruce - mmm. 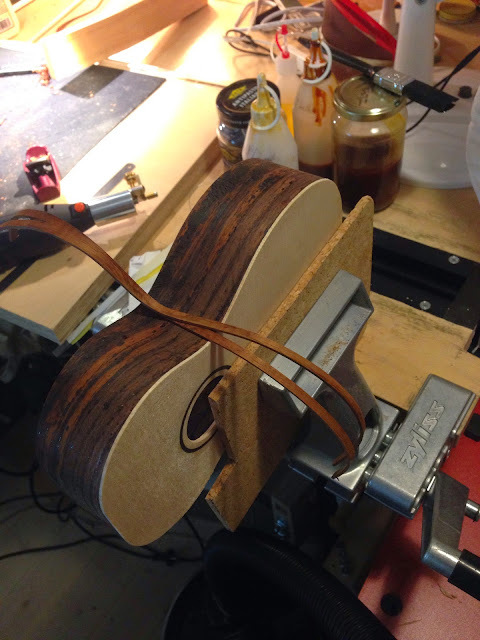 Then things happened really fast - bracing, lining sides, making a rosette, slotting the fretboard for bar frets. The family was as you might gather out again. 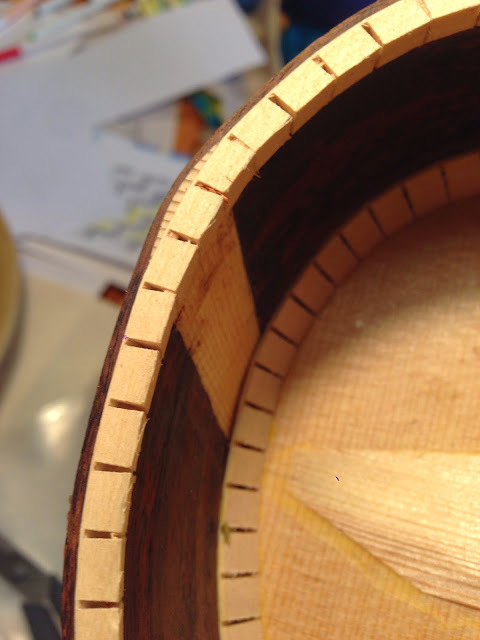 The pic above shows the binding strips before routing the channels, and the one below shows the annoying tear out I fixed with a tiny bit of spruce. Then an alder neck, rough sawn and hand carved as usual. 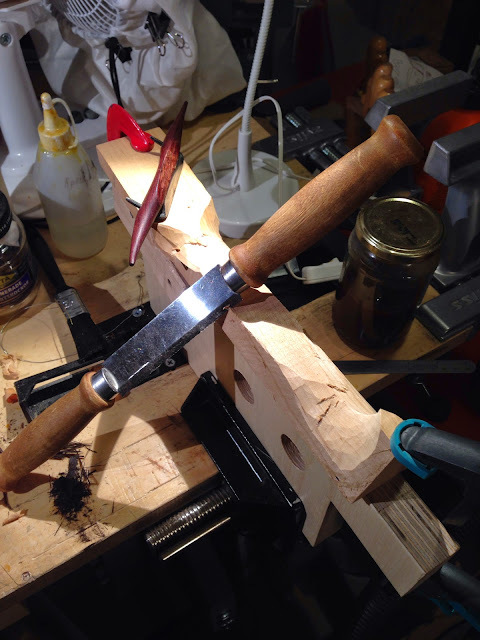 And carefully scraped with a scraper I made from an old Japanese saw. Now that (making the scraper) was hard work, the steel in those saws is tough. But what of the sanded groove? Did I leave that as it was? Nah, I made a convex spruce patch and glued it in. You can see it here. Now I'm off to Armenia. I really look forward to finishing this one. It will be a keeper, but for the best reasons. 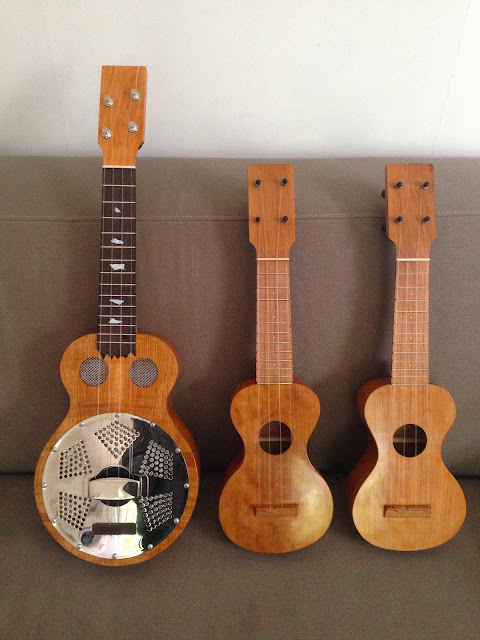 I want a spruce top uke vecause the ugly kit uke I built in 2008 sounds so damn fine. 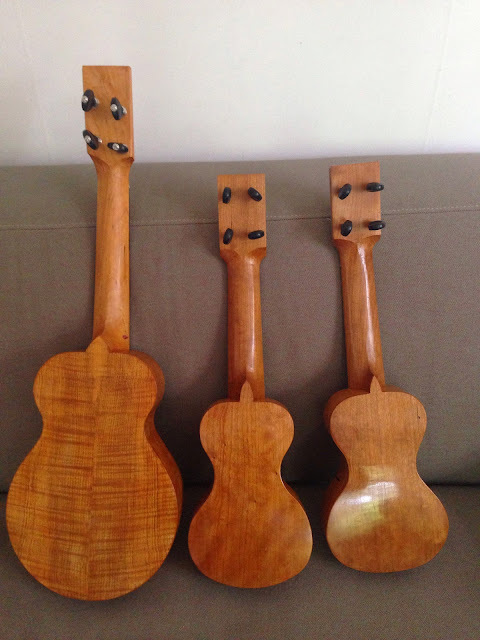 The others I've kept are prototypes and flawed instruments, but now after 70 plus ukes I actually think they start to look as proper instruments.